As Spring has finally made an appearance for many of us, myVegas developer Playstudios has launched a series of Spring-themed updates in its Facebook slot machine game, as well as a new slot machine and real-world rewards which expand the catalog of available items to locations outside of Las Vegas. 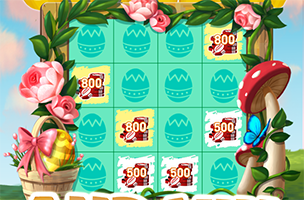 This month will see the launch of the Easter Scratch and Win game, where users can receive hundreds or thousands of chips by finding three matching symbols on scratch-off lottery tickets. Elsewhere, myVegas’ newest machine is called Pandarama, and it’s available for users who invite three friends to play myVegas, or who make a chips purchase. The game focuses on fighting crime in the big city, and includes two bonus games, expanding wilds and the possibility for free spins. Finally, the game’s rewards store has been updated with new content from the House of Blues, with support for House of Blues locations outside of Las Vegas. For instance, users can spend coins on souvenir glassware or complimentary meals (among other items) at House of Blues locations Dallas and Orlando. This month will also see the launch of Vdara Hotel & Spa content to the game. The game’s Easter and Spring-themed content will only be available for a limited time. Check back soon for more, and to follow myVegas on AppData, our tracking platform for mobile and social apps and developers.